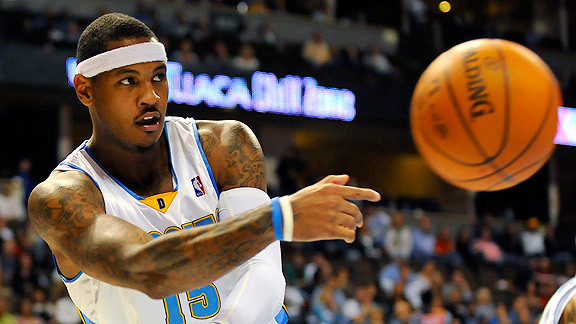 Ron Chenoy/US PRESSWIRE Carmelo Anthony has grown stronger and seems to have figured out how to avoid frustration. Consult the NBA's busiest (and weariest) travelers -- advance scouts -- for a candid read on the first quarter of the regular season. So with most teams either at or due to reach the 20-game threshold this weekend, we've surveyed five scouts who make their living as courtside spectators at three to four games per week -- by granting them anonymity -- to examine some of the league's key developments so far. "Everyone talks about what kind of shape he's in, and you can see it. He's ripped up. He looks tremendous. And now he's just so aggressive that he's playing with a different level of confidence. He was always a matchup nightmare who could take your smaller guy into the post or shoot from the outside against bigger guys, but I think there were times in the past where you could frustrate him and take him out of the game. I don't know if you can do that any more. Maybe LeBron [James] and [Dwyane] Wade figured it out faster, but it looks like Carmelo has figured it out." or should I say because they've got a great, great, great player. And I think there's something to be said for the fact that [O'Neal] leaves Phoenix and all of a sudden Phoenix starts winning. "I see them jumping around [on the Cavs' bench] and acting like they're having fun, so maybe that's a good sign. But I still have reservations because Cleveland built [its] whole foundation the last couple years on being a defensive team. They're just not going to be as good defensively with Shaq on the floor. "It's a big-time work in progress. They're still experimenting on how they want to use him, and ultimately the Shaq experiment is going to be yea'd or nea'd in the playoffs, so maybe he'll prove me wrong. Ultimately whether they win 55 or 65 games in the regular season is irrelevant." "They're a beast. I'm telling you that Cleveland wants no part of these guys in the second round. Whoever gets this team in the second round will have their hands full. They've grown up a lot. They know how to win. And they've got eight, nine, 10 guys now. They can flat-out score now with [Jamal] Crawford coming off the bench, they can bang with you with [Zaza] Pachulia, they've added a quality veteran like Joe Smith, and Josh Smith has come a long way compared to where he was. I think they can play with anybody and beat anybody in the East." I still don't know how the hell they're winning games. "They've played more free-flowing. It's more by committee now. Sometimes in the past they worked so hard to find [Martin] that three other guys ended up sitting and watching. How are they going to work [Martin] back in? If they put him on the floor with Tyreke and Beno, other teams are going to take advantage of them when they do it. Maybe they try to trade him." "The biggest thing is that you have to have great transition defense and also try to keep him out of the paint. The problem is that you can't just go under every screen and dare him to shoot because he has such great range on his 3 ball. He also does a great job of keeping the ball alive, dribbling around like Nash, probing for openings. "It's hard to be physical with him because of his speed. Defensively you can try to make him run through a lot of screens and try to wear him down in pick-and-rolls, but they have pretty good length around him to help. He's very similar to me to a young, passionate Allen Iverson. He's a lot tougher than people gave him credit for, including me. "The thing that's really impressed me is that he hasn't been a high-volume shooter. I know he's struggled lately, but he's been pretty efficient in a lot of games. The bigger question to me is what's going to happen when Michael Redd is back as a consistent player, because he's getting a lot of Michael Redd's shots." "Portland is probably going to trade him sooner rather than later, but I don't think Miller has necessarily been the problem. I really don't want to knock the kid, but I think some of it has to do with [Greg] Oden being on the floor. He's been putting up some numbers, but I think they play more fluidly when [LaMarcus] Aldridge is at the 5. "It's great that the kid's healthy, but Oden jams up the floor sometimes. If you're the other team you want [Portland] to throw it to him. The more he gets it the less it's in their best players' hands. "[Travis] Outlaw being hurt obviously hurts them because he can space the floor. To me their best group is when they're playing smaller. Aldridge is much more of a handful at the 5 than the 4. " there's a lot going on there for Flip [Saunders] to try to pull that all together. "I think Arenas is still good enough to be a 20-point-a-game guy. But not a 30-point-a-game guy. He just seems to lack a little bit of burst that he had in the past. You see it in flashes over the course of a game, but he's more reliant on little pull-ups and long jumpers than he used to be. He used to get a dunk or two every game on dribble penetration. Now those are layups. Or missed layups." "There are probably only two guys in this league who can dominate the ball -- handle the ball on every single set -- and it's good for their teams: Chris Paul and Steve Nash. It's really good for the Suns now because they don't have a high level of depth and they don't have a lot of guys who can get their own shot, so Nash makes their [lives] so much easier. What's he averaging? Eleven or 12 dimes at his age? "I wonder if the way they lost to New York and Cleveland will affect them down the road, but I think they can keep this up in the regular season. The playoffs are a different story. But when you've got six guys shooting better than 40 percent on 3s, that's unheard of. That's hard to stop. "As for Nash, I think he's too smart to be slowing down. He's not like Derrick Rose or Dwyane Wade, taking a lot of contact, falling a lot, trying to dunk on guys. He knows how to get rid of the ball before [absorbing] major contact. He shoots floaters to protect himself. He might get a little banged up on defense, but he knows how to take care of himself and he knows how to take care of everybody else." "From what I've seen, Artest gives them a swagger. He puts his hands on guys he's guarding and he can make shots from the perimeter. He's in great shape. He plays multiple positions. And, believe it or not, has the respect of the officials. In one game I saw he really handled Kevin Durant, took him right out of the game. "Now they probably would have the same record if they had [Trevor] Ariza instead of Artest. And Ariza's younger. But I like Artest for the Lakers in the short-term. It's hard to evaluate it after 20 games because you always wonder: Is he going to do something off the court? Is he going to get suspended? Will he be here in three years? But I kind of like where [Artest] said that he's the captain of the defense and Kobe's the captain of the offense. I respect the dude." "It's the Lakers, hands down. They're so physical across the board, all the way down to Derek Fisher and Shannon Brown. They're enormous. They're just big, strong, physical guys that can really get up into you and defend you. They're just big and strong and versatile and they can really do damage with their defense. The days of questioning [L.A.'s] toughness are over." The results are already in on the wrist surgery we covered in a blog post early Thursday morning about Raja Bell and the inevitable interest contenders would have in trying to trade for him if he made it OK through the operation. The Warriors, playing host to Houston on Thursday night, announced after their shootaround that the procedure to repair ligament damage in Bell's left wrist was successful. Successful enough to convince someone to trade for Bell between now and the Feb. 18 trading deadline? The Warriors' news release projects Bell to be sidelined a minimum of three months, with an initial six-week period during which the wrist is immobilized. So why TBD? Reason being: It's a trickier-than-anticipated timetable that falls between the pre-surgery projections of (A) 4-to-6 weeks in the best-case scenario and (B) likely out for the season in the worst case. Word is Bell has already attracted trade interest from a few contenders even though he just got to Golden State on Nov. 16 in the Stephen Jackson deal. The Spurs' desire to trade for Bell -- don't forget that San Antonio had him in training camp once before, or that he and Tim Duncan are old pals from the U.S. Virgin Islands -- has been confirmed. It's likewise reasonable to conclude that Cleveland, after longstanding talks with the Warriors in the Cavs' pursuit of Jackson, has registered interest in Bell as well. Makes sense, too. What contender couldn't use a wing defender of Bell's stature who can also drain the weakside 3 and who happens to be playing on an expiring contract valued at a reasonable $5.3 million? It remains to be seen whether a team is willing to trade for Bell between now and mid-February if he's unlikely to be back playing before March. The Warriors will undoubtedly insist that they absolutely refuse to buy Bell out before March 1, meaning that interested suitors won't have the option of signing him as a late-season free agent and still have Bell eligible for the playoffs. If Golden State holds firm to that stance, then trading for Bell before he's all the way back -- and with only about a month to get him ready for the postseason -- would be the only way to acquire him. Yet Golden State faces some urgency of its own because it has so many injuries. The Dubs are still struggling to come up with eight healthy bodies every night, with Kelenna Azubuike (knee) and Brandan Wright (shoulder) lost for the season, Bell out long-term and Speedy Claxton (knee) and Devean George (knee) yet to play yet this season. The Warriors might be OK if Andris Biedrins (groin/back) and Ronny Turiaf (knee) make it back reasonably soon, but every rebound is a struggle with the injury list they have, which is why Anthony Randolph is trying to play through an ankle sprain. Mark Blount remains in fantasy exile, earning nearly $8 million this season to stay away from the Minnesota Timberwolves after they reacquired him in mid-August in a deal that sent Quentin Richardson to Miami. If he wants to play this season, Blount could try to initiate buyout talks with the Wolves by giving back some of that $7,962,500 salary, but sources with knowledge of Minnesota's thinking said this week that Wolves general manager David Kahn would prefer to keep hold of Blount's contract just in case some sort of trade scenario that requires Blount's inclusion materializes between now and the league's Feb. 18 trading deadline. If that stance doesn't change and no trade develops to lift Blount from the Wolves' payroll before the February deadline, that's when a buyout will be considered. Kahn granted permission to Blount's agent, Mark Bartelstein, to explore trade possibilities back in September before training camp started. 49: Tim Duncan, Tony Parker and Manu Ginobili have all been in the lineup for only 49 of San Antonio's past 98 regular-season games. 3: Aaron Brooks has scored 20 points or more for three consecutive games for the first time in his career, helping Houston to a 3-0 start on its current four-game road trip. The Rockets are 5-1 this season in Brooks' six 20-point games. 3: Before its win in Denver last Sunday, Minnesota became just the third team of any of the major North American sports leagues to lose at least 15 consecutive games after winning its season opener. The other two were the Orlando Magic (19 consecutive losses after a 1-0 start in 2003) and the NFL's Carolina Panthers (15 straight defeats after a 1-0 start in 2001). 4: When Andrew Bynum led the Lakers with 21 points and nine rebounds in Tuesday's home win over New Orleans, it was just the fourth time in Bynum's 228 regular-season games as a pro that he led L.A. outright in both categories. 3: With 13 points, 20 rebounds and 4 blocks in Tuesday's home loss to Miami, Greg Oden became just the third player in Blazers history to reach the 10/20/4 plateaus in the same game, joining Bill Walton (who did it seven times from 1974-77) and Joel Przybilla (2005). If it was my team, I wouldn't want to play 17 of the season's first 21 games at home like this season's Lakers. I wouldn't see that as a huge advantage, knowing that so many road games await in the next four-plus months. I'd say the following set of lopsided numbers represents a far bigger plus for the defending champs. This is a list of the league's five most prolific points-in-the-paint scorers entering Friday's play. You'll note three of them are Lakers. Q: How discouraged were you by the slow start and the early injuries after all the hoopla about this team in the offseason? A: Discouraged? Most of us have been in this league way too long to get discouraged this early in the season. That would just be foolish on our part. We understand that [injuries are] a part of it. The teams that can get some wins when guys aren't 100 percent healthy and then get healthy by the end of the season are the teams that typically have success. Q: Has adjusting to this team come slower than you thought? A: You understand that there's a learning curve. And the learning curve gets increased a little bit when guys like Tim [Duncan], Manu [Ginobili] and Tony [Parker] are out. But we're a pretty confident group of guys here. We understand that it's a process, that it's not going to be easy, but we're all very positive right now. Q: The Spurs have often been slow starters. Was it unrealistic to expect anything else with so many new guys? A: In order for you to become the team that you want to be -- the team that's ready for the playoffs -- it's going to take a while. It's going to take 60 games, 70 games, for you to really become that group of guys where you have the trust and confidence that you really need to make a deep playoff run. Q: How much pressure was there coming into the season, knowing that so many people said your arrival was the key to the Spurs getting back into the West's elite? so these [main] guys can get some rest and not feel pressure when they're injured to get back on the court just to get some wins. Q: Do you think this team still has championship potential if you can keep your main guys healthy? A: I hope so. But I hope for healthiness for everyone. For Kevin Garnett. For Andrew Bynum. For all the guys that dealt with injuries the last few years. I think it'd be great to have a bunch of healthy teams at the end. Everyone was excited about the NBA coming into the season. It'd be a lot of fun to see at the end of the season who's the last man standing if everyone's healthy. • Sources close to the situation say that Iverson and Andre Iguodala had a clear-the-air chat on the phone before Iverson committed to signing for a pro-rated $1.3 million for the rest of the season to make sure there was no lingering frostiness from their first stint as teammates for two-plus seasons. Insiders say there's been undeniable tension between the AIs previously. • The Sixers have the option of waiving Iverson on Jan. 6 to leave enough time for A.I. to clear waivers -- four days before one-year contracts leaguewide become guaranteed for the rest of the season because Jan. 10 falls on a Sunday this season -- if this reunion doesn't work out and they want to save three months' worth of salary. But I can't see that happening, no matter how easy Philly says it might be to part ways with Iverson should he and Lou Williams fail to click upon Williams' return from a busted jaw. As one source close to the situation said: "How can they cut the legend in January just like that?" The most likely scenario is that Iverson finishes the season with the Sixers before they use the extended quiet of a long offseason to part company for the second time. • Does anybody in the NBA do heart-on-his-sleeve better than A.I.? I'd love to hear some other nominations if you have them. I also find myself in total agreement with the A.I. expert we consulted who said that Iverson unavoidably revealed more than he wanted to with his tears at Thursday's press conference. The expert said: "I think those tears showed you that he knows he doesn't have the [stature in the game] that he used to and how much that hurts him." 19,583: That's how many points Iverson scored with the Sixers from 1996-2006. No player in NBA history has ever returned to a team for which he previously scored that many points; Golden State's Chris Mullin is next in line with 16,120 points when he rejoined the Warriors in 2000. .305: That's Brandon Jennings' shooting percentage over the past six games. Milwaukee is 1-5 in those games as Jennings has made just 32 of 105 shots from the field, averaging 14.7 points in that span. Jennings averaged 22.0 points per game in November, scoring 308 points in 14 games. Memphis' O.J. Mayo averaged 23.1 points in 15 November games last season, but the last rookie to average 22 points per game in November before Mayo was Michael Jordan for the 1984 Bulls (26.2 ppg in 14 games). 2: New York's Al Harrington, with two 40-point games off the bench in the Knicks' first 19 games, has 63 more games to do it again and become the first bench player since the NBA/ABA merger in 1976-77 to do so more than twice in a single season. Chicago's Ben Gordon (2006-07) and Milwaukee's Brian Winters (1981-82) are the only others since the merger to post two 40-point games as a sub in a season. 9: After being held below 90 points in three of its previous four games, Atlanta had nine players in double figures in Wednesday's 146-115 rout of Toronto, matching Golden State's 146 points against Minnesota last month for the season's highest single-game scoring output. Maurice Evans finished with nine points, leaving the Hawks just shy of the NBA record of 10 double-figure scorers in one game. It was the first time Atlanta scored that many points in a game since January 1993. 12 (and 9): Shaquille O'Neal's 12 points and 9 rebounds in Wednesday's win over Phoenix in his first game against the Suns since they traded him to Cleveland in June matched the 12 points and 9 rebounds Shaq had for the Suns against Miami in his first game against the Heat after they traded him to Phoenix in February 2008. In his first game with Miami against the Los Angeles Lakers in 2004-05, Shaq had 24 points and 11 rebounds. In his first game with the Lakers against Orlando in 1996-97, Shaq had 25 points and 18 boards. In Boston's recent home loss to Orlando, according to our ridiculously thorough friends at the Elias Sports Bureau, Kevin Garnett became the youngest player in NBA history to log 40,000 minutes. Garnett was 33 years and 185 days old when he got there. The player KG eclipsed: Oscar Robertson, who was 34 years and 39 days old when he reached the 40,000-minute mark. If you've been watching the Celtics, though, inevitable concern about that sort of mileage has to be tempered at least somewhat by the fact that KG's much-discussed knees clearly appear to be strengthening. How else to explain the frequent lobs teammates are throwing him? Seriously. It says here, based on our purely unscientific data, that it has to be a good sign that KG is getting back to his 'Sota frequency with the alley-oops. The Nets, at 0-18 entering Friday's home date with Charlotte, are just three more losses away from sinking as low as the 1988 Baltimore Orioles, who posted the worst start in the history of North American team sports at 0-21. The Nets are also just five more losses away from matching the longest single-season skid in NBA history: 23 consecutive losses for the Denver Nuggets in the 1997-98 season and the Vancouver Grizzlies in 1995-96. The flap that followed Zydrunas Ilgauskas' benching last Saturday against Dallas, with Big Z on the brink of breaking Cleveland's franchise record for games played, continues to be a touchy topic almost a week later. Our own John Hollinger ably digs into it here. But we're going to focus more on the facts than the flap, because Ilgauskas' milestone -- which he finally achieved by appearing in his 724th game as a Cav in Wednesday night's home rout of Phoenix -- makes this an ideal time to update the league's All-Longevity Team. 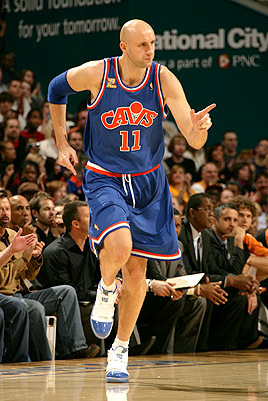 Ilgauskas was selected by Cleveland with the 20th pick in the 1996 draft and began his Cavs career in 1997-98. Only one player in the league -- someone named Kobe out in L.A. -- has been with his current team longer. P.S. : Indiana's Jeff Foster is the All-Longevity sixth man, having debuted with the Pacers in their NBA Finals season of 1999-2000. P.P.S. : According to the Elias Sports Bureau, Ilgauskas is one of only two active players who ranks as his team's all-time leader in games played after surpassing Cavs general manager Danny Ferry's 723 games. Big Z's only peer in that category is Charlotte's Gerald Wallace, who is the Bobcats' all-time leader with 347 games played. "We have 19 of them. What are we going to do? Just mail it in 19 times when we have a back-to-back? That can't happen. We have to find a way to fight through it with mental toughness." Raptors coach Jay Triano, way back on Nov. 7, when Toronto got spanked in Dallas by 28 points on the second night of the season's first back-to-back. I was in the media audience that night when Triano responded to his team's 129-101 surrender with a public challenge to his players. About a month later, sadly, Toronto's resolve in back-to-back situations has somehow only deteriorated. The Raps have completed three more of those back-to-backs since their Texas visit. They've been the road team in each of those cases, but that doesn't excuse the following scores: Utah 104, Toronto 91; Charlotte 116, Toronto 81; Atlanta 146, Toronto 115.
while surrendering an average of 123.8. On Thursday, which happened to be the one-year anniversary of his elevation to head coach replacing Sam Mitchell, Triano was greeted by critical comments in the local paper from guard Jarrett Jack, who suggested that Triano does not respond to the Raps' defensive breakdowns by "attacking them or challenging them or bringing them to the forefront and getting them solved." which only ends up highlighting the Italian's defensive frailties even more. The result? Growing rumblings out of Toronto suggest that one of the Raptors' many issues these days is growing tensions between the internationals and the American-born players on the roster. Which, as always, brings us back to Bosh's future. A few weeks ago I wrote -- and believed in the strongest terms -- that the most likely scenario in free agency for Bosh next summer is re-signing with the Raps. One of the assertions made in that edition of the Weekend Dime: "Every indication I get is that Bosh likes his current setup in Canada much more than we Yankee outsiders imagine." This, though, is the one scenario that can override how much Bosh actually likes Toronto as a city and any other factors in the Raps' favor. Their highly disappointing 7-13 start is already looking a lot like last season's 33-49 nightmare. It gets a lot easier to imagine Bosh -- or maybe even his bosses -- wanting a fresh start if they can't turn things around quickly.